There are many reasons to come to Park City in the summer, but one recreational endeavor seems to create a lifestyle so dedicated to the sport, they build communities around it ...GOLF. Pictured above is the par 5, 16th hole at Victory Ranch Club. Of all the challenges our par-72, championship course offers, perhaps the most challenging is keeping your eye on the ball. With fantastic mountain panoramas and a luxurious course with all bent grass turf, you’ll enjoy one of the finest golf environments. Meticulously designed by Masters and British Open Champion, Mark O'Meara, our 7,801-yard course is sheltered in Tuhaye’s rolling hills for a traditional golf experience in a mountain setting. With luxurious bent grass tees, fairways, and greens, Tuhaye offers one of the finest playing surfaces possible. Coupled with five individual tee boxes on most holes, a number of split fairways, and the course length of your choice from 5,500 to 7,801 yards, the golf experience at Tuhaye is forever fresh. Tuhaye is currently constructing their new clubhouse for members. Victory Ranch is a master-planned, private, gated ranch community, located 17 miles east of Park City/Deer Valley Resort, Utah. Five private miles of the Provo River run through the expansive 5,600-acre ranch. Victory Ranch Club will include approximately 693 homesteads ranging from one to twelve acres in size and approximately 120 three- and four-bedroom ranch cabins. A Rees Jones championship course follows the natural terrain and provides expansive views of the surrounding area. Victory Ranch Club embraces a vast western landscape with majestic vistas of Deer Valley ski runs, the Timpanogos Mountains, the Jordanelle Lake and the Provo River. The heart and soul of this land is its river, where Victory Ranch Club maintains a standing reverence for catch & release, blue-ribbon fly-fishing. The course at Glenwild was designed by Tom Fazio, one of the most celebrated designers of our time. In fact, no living designer has more credits on Golf Digest's list of America's 100 Greatest Golf Courses and Golfweek's collection of America's Best. Fazio is known for creating golf that blends naturally with its environment. And the private 7,541-yard, par-71 course does just that. The "core golf " layout embraces the natural topography and features of the land, creating an almost seamless transition from course to countryside. With superb routing away from homes and roads the course takes advantage of the awe-inspiring scenery and shot values that enhance its playability and scenic appeal ensuring that it will become known as one of the finest golf courses in America. Estates West Magazine says about the current Pete Dye designed course: "Altogether, it's a stunning and memorable course." And Travel & Leisure Golf Magazine writes "there are six sets of tees (including one for juniors), ample saddled fairways, greens that could be measured not in square feet but in acreage and nary a railroad tie or pot bunker in sight." Jack Nicklaus does it again. His highly anticipated golf course is scheduled to open in 2006. Set against a mountain backdrop in Promontory's scenic Painted Valley, the course has been carefully planned to delight the senses and reward players of all abilities. Frequently ranked among Golf Digest's Top 100, his signature course at Promontory is very likely to follow suit. Located in the heart of Park City, Park Meadows Country Club is only a few minutes from nearly anywhere in town and has the best views of all 3 ski areas from our central location. Members enjoy convenient access to a private, first-class equity club. Home to 10 Champions Tour events during the 1990's. Our club is owned by our members, and is managed exclusively for the members' benefit and enjoyment. This Jack Nicklaus Signature course designed in the Scottish links tradition has 105 sand bunkers and water on 12 holes. Excellent catering services & banquet facilities. Other amenities include a fitness center and pool. Jeremy Ranch and Pinebrook are only minutes from Park City and consist mainly of primary residences. Jeremy Ranch surrounds the Arnold Palmer designed 18-hole Jeremy Ranch Golf Course and is located on the east side of Interstate 80. Pinebrook includes a new neighborhood park and is home to the newer Ecker Hill Middle School. It is located opposite Jeremy Ranch on the west side of Interstate 80. Summit Park and Timberline are densely wooded areas and is on the edge of the Summit County boundry next to Pinebrook. These neighborhoods are attractive due to the proximity and easy commute to Salt Lake City. 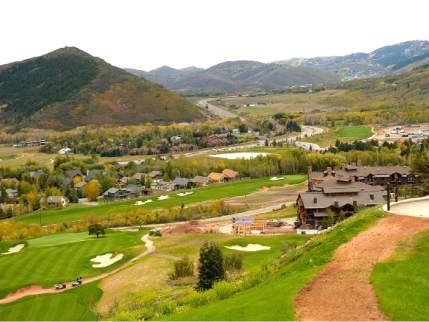 Soldier Hollow's two mountain golf courses are the newest addition to the Wasatch Mountain State Park. The championship, 36-hole facility completes the year-round recreation programs at the 2002 Olympic and Paralympic Winter Games venue. Two 18-hole courses — appropriately named the Gold and Silver courses — offer challenging play for golfers of all abilities and amazing views of the Heber Valley and majestic Mount Timpanogos. Golfers and non-golfers alike will enjoy the beauty of the facilities, the new clubhouse with floor-to-ceiling windows and the onsite restaurant serving breakfast, lunch and dinner. Gene Bates Golf Design provided the unique design, which boasts native Utah vegetation, one of the longest courses in the state and the originality of being the only golf course built on an Olympic venue. Along with other Bates' projects — from Florida's wetlands to the coastal regions of California and the rocky desert of southern Utah to the Green Mountains of Vermont — Soldier Hollow's 36-hole complex is sure to become a favorite Utah golf destination. The park’s challenging 18-hole Mountain Course (cart required) is carved from natural mountain contours, and is known for occasional sightings of roaming deer, elk, wild turkeys, moose and other wildlife. You’ll reach vantage points overlooking the beautiful Heber Valley below. The 18-hole Lake Course lies on gentler terrain, where surrounding mountains slope away to the valley floor. Season-long pastoral beauty, with tree lined fairways and eight lakes and ponds, offers just the right setting to make the Lake Course a favorite for high, low and “no” handicappers. The Crater Springs course, located only 20 minutes from Park City at the Homestead Resort, is a par 72 course measuring 7,017 yards from the back tees and plays 5,091 yards from the forward tees. Our course rating is 73.0 from the back tees and 68.2 from the forward. Weather permitting, we're open April 1st through October 31st. To improve your game, we also have a practice putting green, chipping green, driving range and club rentals. Our golf shop is above par (unlike a game of golf, that's a good thing) with golfing attire, shoes, clubs and equipment for men, women and children.Golfers will find that our greens are bent grass, our fairways are bluegrass and our golf shop is first class. When the original 18-hole layout at Mountain Dell was expanded and a 36-hole facility opened in 1991, the Lake Course incorporated the majority of the new holes sculpted out of the Wasatch Mountains by renowned architect William H. Neff and PGA Tour consultant Mike Reid. The Lake Course at Mountain Dell features narrow, rolling fairways and dramatic tee shots over deep ravines and water, which place a premium on precision and accuracy. Using the natural terrain, many holes on the Lake Course are carved out of the scrub oak and native bushes while providing breathtaking views and strategic challenges. The Lake Course is situated at 6,000 feet above sea level, so long hitters can go for the par-4 fourth green, which measures 371 yards from the blue tees and 310 yards from the whites. It is a picturesque, dramatic, risk-reward opportunity that ranks as one of the most memorable holes on the golf course. After an exciting day of golf, stop by the clubhouse and visit the lounge and pro shop, or take advantage of the on-site instruction offered. The mountain setting and clubhouse facilities provide the perfect venue for banquets and post-tournament receptions. Park City opened yet another excellent golf course in the fall of 2014 at the Canyons Resort, and it is simply stunning. Experience breathtaking views of the Wasatch and Unita mountains as you wind through 97 acres at the base of the Canyons Resort. The 18 hole, par-70 golf course was carefully designed to be both challenging as well as enjoyable. The seven par-3 course features over 550 feet of elevation change, 297 of which are on 10 hole alone. Adding to the long list of amenities offered at the Canyons, their golf course makes this destination the perfect place to come and spend the entire day. After a leisurely round of golf, enjoy a large variety of shops, restaurants, or even hiking and biking without having to leave same the parking lot. Have any young golfers in the family? Make sure to keep an eye out for the Annual Alliance Golf Scramble each June at the Canyons and get your team in! Need Help Finding a Golf Property?